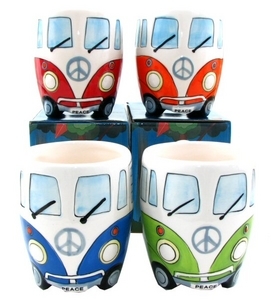 Check these classic retro campervan mugs out. With an ever so slight change on the design, the creators cleverly sidestepped the wrath of a certain vehicle manufacturer’s legal department. We all know what they are are supposed to represent though… (*Cough* Volkswagen *Cough*). Each of the mugs is individually hand painted, so that no two are exactly alike. Grab one for your campervan lovin’ hippy friends.